Even the biggest food retailers are small compared to other major international players, and e-commerce is increasingly challenging traditional businesses. The food sector is one of the most important Italian industries, employing around 385,000 people in more than 6,800 companies, and generating total turnover of more than EUR 137 billion in 2017, which amounts to 8% of Italy´s GDP. Food production increased 3.2% year-on-year in 2017 and 1.9% in 1H of 2018. Export of agrifood products recorded a solid 6.8% increase in 2017, to more than EUR 41 billion, and grew 3.1% in H1 of 2018. Domestic consumption was less dynamic with just a 0.9% increase in 1H of 2018. 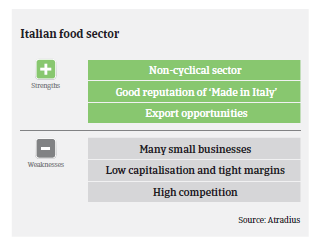 Italian food production, processing and retail remain heavily fragmented, with a very competitive business environment. The meat segment has benefited from turnover stabilisation in 2017 and 2018 after several years of declining sales triggered by changed consumption habits, while the beverage sector recorded good export performance, especially for wine. High competition, too many players and a low average size of food retailers impact the food retail segment. Even the biggest Italian food retail businesses are small compared to other major international players. At the same time, e-commerce is increasingly challenging traditional brick-and-mortar food retailers. However, for the time being this segment remains rather resilient, and a positive credit cycle helps mitigate the risk of liquidity distress. 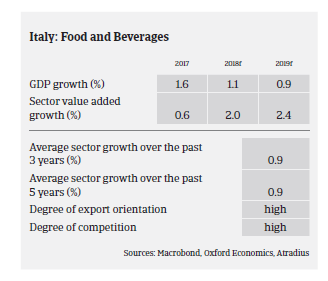 While the general forecast for Italy´s economic performance has become more uncertain, it is expected that food sector growth will continue in 2019, based on the industry´s resilience. 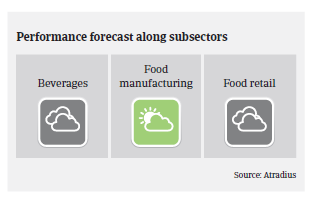 While the profitability of food businesses is generally low, profit margins are expected to remain stable in 2019, also taking into account the current level of food raw material prices. Food producers and processors are often highly geared in order to maintain working capital requirements. Due to its anticyclical business performance, lending to the food industry remains appealing to banks and other financial institutions, enabling them to diversify asset investments. Since 2012 a new law (‘Article 62’) lays down a maximum payment term in the food sector of 30 days for perishable goods and 60 days for non-perishable goods. We observe that most businesses are abiding by those terms, while requests for protracted payments could be a first signal of liquidity problems of buyers. Given the forecast of solid performance we expect there will be no significant increase in payment delays and/or insolvencies in 2019. Our underwriting stance for Italian food businesses remains generally open. A more selective approach is applied on the food retailers subsector due to the challenging market environment, including the growing competition from e-commerce. In a highly competitive and fragmented market retailers’ profit margins are expected to remain under pressure in 2018 after deteriorating in 2017. Higher margin pressure as demand from the automotive sector is expected to decrease in the coming months, while demand from construction remains sluggish. As in previous years, competition remains strong in the domestic market, mainly among small and medium-sized machinery companies depending on construction.